Having Some issues with what I would like to do. I am trying to get discart to display in a dynamic list panel container on the home screen for library data provider music widgets. I'm actually thinking it may be a limitation of the script so it may border on a feature request or quite possibly something I have missed. For music artwork such as Window(Home).Property(SkinHelper.Music.DiscArt). It works fine using $INFO[Window(Home).Property(SkinHelper.Music.DiscArt)] outside of container 8001. 1. Within the panel container 8001 it will not show any discart. 2. I have two containers for widget 1 (8001) and widget 2 (8002). So setting the onload property will not work for each container. 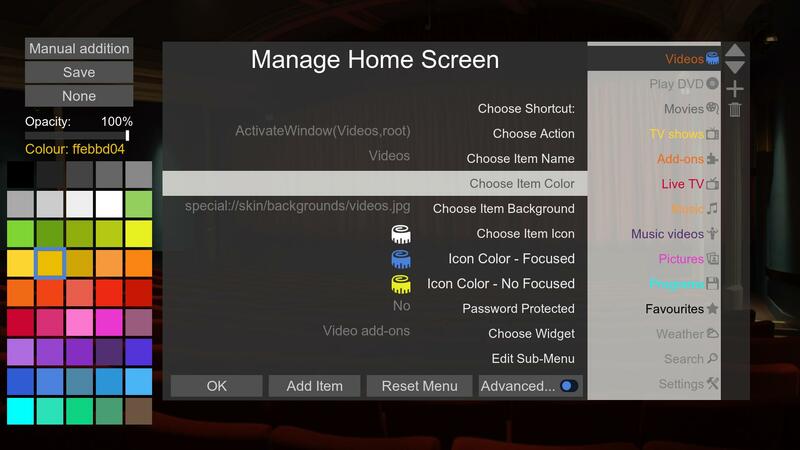 You can't use $INFO properties (home properties or skin settings) inside a container, it's a Kodi limitation. Even if that would work it wouldn't be a great idea because this method will only provide you the details for the current focused listitem. (2015-11-14, 04:30)SeedyEvil Wrote: Just starting to use this great script on a small mod of a MusicVisualisation.xml. I'm using the following to display artist logo. I will look into it right away. Can you test with the latest Git ? I changed it a bit to prefer the real artist instead of the artist belonging to the album. Remember to flush the cache before testing in the addon settings.. I can't confirm that. skin.helper isn't loading any logo for some compilations or is loading the "Various Artists" logo for an album which logo was displayed correctly before. second track: logo for "Various Artists"
third and fourth track: correct logo for "Creedence Clearwater Revival"
Marcel, Does this box can't run your helper? Marcel, Since your color picker is become very advanced, I am now Integrating my own color picker with your script. I moved all my colors, to extras\colors folder and created colors.xml file. Track listing should be fixed with latest Git, can you check please ? (2015-11-15, 20:13)tomer953 Wrote: Marcel, Since your color picker is become very advanced, I am now Integrating my own color picker with your script. I have looked at the code and the only error I could spot is when the dialog was closed (back/exit button) when no color was selected it would throw this error. I have just fixed that on Git. I'm fine tuning my autoconfig and just noticed using the backup restore in silent mode doesn't show the progress and "completed" notification as it was previously. Is this a normal behavior or did I miss something ? I first thought it wasn't working but I see my views changing realtime, so it writes the settings correctly. But since it works in background without notifications, I'm also able to browse my designer and change the settings that are writing by your script the same time (and my restore takes about 2/3 mins to write everything). (2015-11-15, 13:34)Solo0815 Wrote: I can't confirm that. skin.helper isn't loading any logo for some compilations or is loading the "Various Artists" logo for an album which logo was displayed correctly before. I changed the code a bit more in the quest to get the music artwork right. Can you please test with the latest Git version ? (2015-11-16, 14:55)Jayz2K Wrote: I'm fine tuning my autoconfig and just noticed using the backup restore in silent mode doesn't show the progress and "completed" notification as it was previously. Is this a normal behavior or did I miss something ? What was there was a dialogbusy while the action is running but I accidentaly removed that. Now the busdy dialog is back for silent operations, can you confirm with latest Git ? I've just added some additional pvr poster artwork in the MadNox skin to the includes_PVR.xml file for the ChannelOSDExtended section. However, what I'm finding is that whilst the poster artwork is being displayed, it's only showing for the current item being played, ie when I scroll up/down on each channel the artwork is not changing accordingly like it does with the poster artwork I added to the MyPVRChannels.xml.